This is a very small mushroom less than 3mm in diameter of the cups. They are extremely small mushrooms, rarely exceeding a few centimeters in diameter and often only reaching diameters of a few millimeters. They are frequently overlooked, unless they happen to be growing in large clusters. This one have a large colony. A very interesting macro shot of these little mushrooms. Perfect light management for rendering perfect exposure on the mushrooms. Great details can be admired. I like the diagonal emerging of the trunk backed by a nice green blurred BG. Wonderful macro of these tiny mushrooms! You managed such an "envious" clean smooth BG which lets the fungae be totally undisturbed. I like your use of shallow DOF and how the mushrooms trail off in a repeating pattern into the soft background. The gradual blurring of the mushrooms and warm lighting work well together. 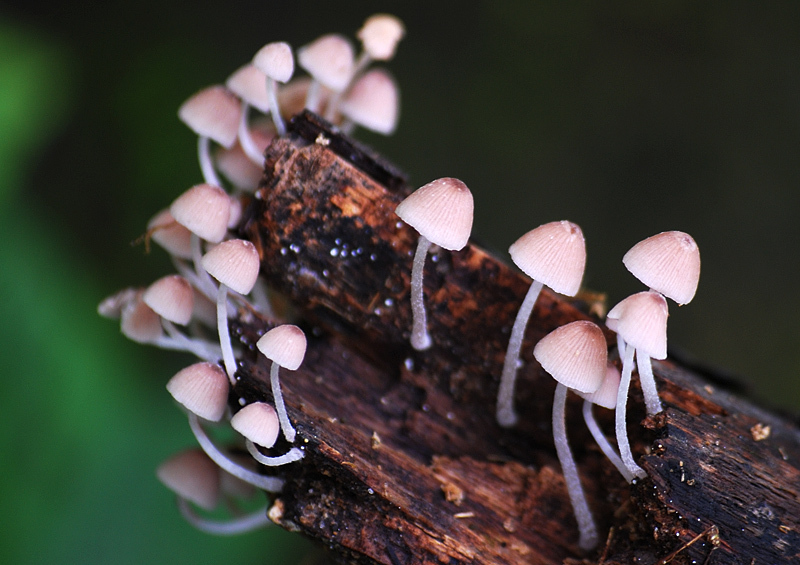 A nice macro capture from mushrooms growing over a decayed wooden bark! The focus is pin-sharp and clarity is amazing. Great colors and perfect contrast between the mushrooms and the blurry dark green BG. A wonderful macro work Jusni! !very well captured with beauitful DOF even within limited distance,beauitful colors and good focus on the FG tiny mushrooms which seems like some lamps,a lovely piece of nature presented here. a perfection of nature in our eyes! The balanced composition of educational quality! Very nice capture of this unusual mushrooms, I like the colors. Great pov and dof with sharp details. Well done, tfs. You're right, these fungi belong to the genus Mycena, but they're impossible to ID further without microscopic analisation. Great composition, colors, sharpness and light management. Gorgeous shot! Bravo!